Harrogate Town’s Dominic Knowles has declared himself pleased with the club’s start to their first ever National League campaign. The Wetherby Road outfit sit in fourth place following a seven-game unbeaten run, and their leading scorer is targeting more of the same when Eastleigh visit on Saturday. “It’s gone really well for us so far, probably as well as we expected if I’m honest,” Knowles said. “Outsiders might be surprised by our results, but we believe in ourselves, we know we have a lot of quality within our squad and there’s no reason why we shouldn’t be up challenging around the play-offs this season. Inconsistent Eastleigh head to the CNG Stadium this weekend 16th in the table having won three but lost four so far and Knowles believes Town can achieve another positive result. “Our home form has been great since as far back as last season and we go into Saturday very confident,”Knowles added. "We train on the 3G every day so that's probably an advantage, but we play good football as well." Eastleigh manager Andy Hessenthaler is no stranger to Harrogate having represented the town's veterans side in the past, helping them to three consecutive Seniors World Cup successes. Paul Bell's Harrogate Veterans have been chosen by the Football Association to represent the nation at the annual tournament for the past 11 years and picked up their fifth title, beating Scotland 4-0 in the 2018 final at Hua Hin Stadium, Thailand. 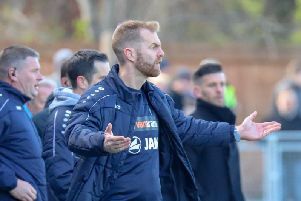 Harrogate’s coaching staff and several of their key players form the core of the group, but their enhancement by several other ex-professionals from around the country, including Hessenthaler, has enabled them to compete with other nations who have similar squad profiles. Now 53, Hessenthaler made more than 550 league appearances, mainly at Watford and Gillingham, and was voted the latter's best ever player by supporters. He carried on playing professionally into his early forties before taking up managerial roles at Gillingham, Leyton Orient and then the Spitfires. Last time out, Hessenthaler's men were beaten 1-0 by Ebbsfleet United on home soil. For live updates from Saturday's game, follow @HarrogateSport on Twitter from 3pm.